Happy Tuesday! A day late, but I have another quilt finish to share! The quilt has been a long time coming, I bought all the fabric for it a few years ago and it has been waiting to become a quilt. When I saw that they were reprinting Lush by Erin Michaels, I jumped up and down a little! 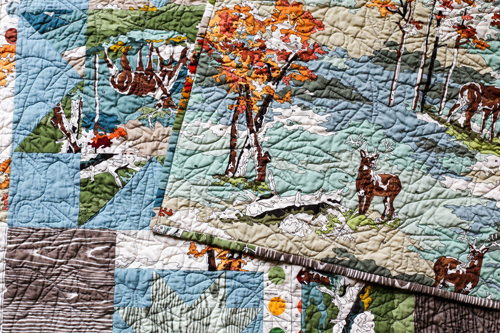 My Dad loves the outdoors, and the deer prints in this collection are especially perfect for him. I snatched up a sizeable amount, including enough for a backing. I always knew I'd turn them into a quilt for him. Last year, I came upon this awesome shot cotton at a local shop that is a perfect match to the blues in the collection. This is the third time I've used the Sparkling Cider Quilt Pattern by All Washed Up, and it's still a favorite. It comes together so easily and I love the finished product. You can see my first two quilts here and here. 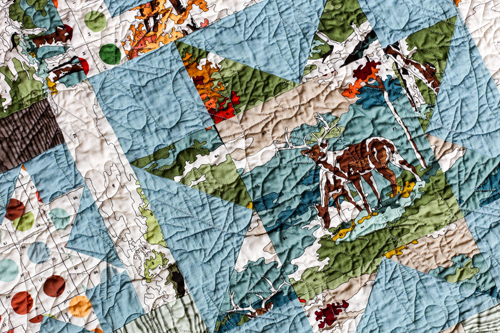 I knew it would be a good choice for this fabric, and I used the large stars to showcase the deer fabric. 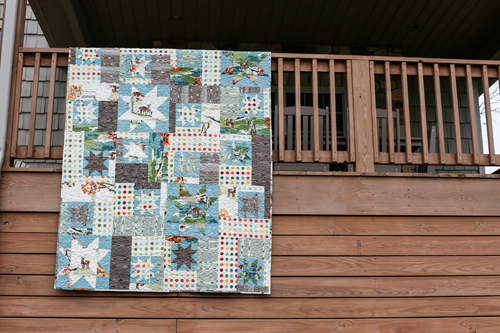 It's always fun to step outside my neutral solid comfort zone, and I'm glad I did with this quilt. The background has a nice sheen to it in person and I think something neutral would have been too flat. For the binding, I decided to use up scraps from cutting the blocks. It was a good way to use some of those up. 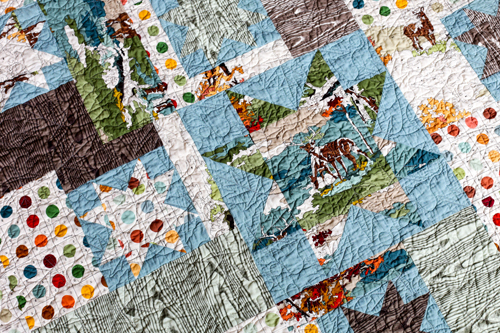 For the quilting, I sent it to Melissa of Sew Shabby Quilting. She had the perfect pattern for it, a Maple Leaves pattern. I love how much it adds to the quilt! I gave this quilt to my Dad for his Birthday, which is right before Christmas. He loved it, yay! I'm glad that I stashed away so much of it and was able to make a quilt that was perfectly tailored to him. Plus, it was a great excuse to make another Sparkling Cider! I'm sure it won't be the last one I make! Pink Castle Fabrics currently has this pattern in stock, here. This is so colorful and happy. Of course your dad loved it! I love your quilt. That blue green bkgd color melts me -- what is it? Love this along with your other two! I'm so glad you posted a link to buy the pattern. I've wanted it a long time but never could find it, thanks! Looks awesome :) Thanks for the link to our shop too! <3 the whole reason I bought this pattern is because of the vintage sheet version you made a long time ago! It's so gorgeous!!! :) I'm sure he loves it, perfect match! I was just thinking while reading this... "I like that quilt pattern, I need that!" And then when I saw the blurb about it being available at pink castle I remembered "oh yeah, I bought that pattern when I went to pink castle!" Hooray! Thanks for the reminder! 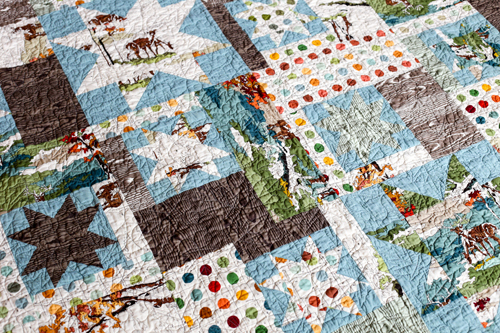 Jeni, what a great quilt for your Dad--and that is a wonderful pattern! Another fabric question--do you remember what the multicolored dot material is--it's such fun. It's from Lush by Erin Michaels! 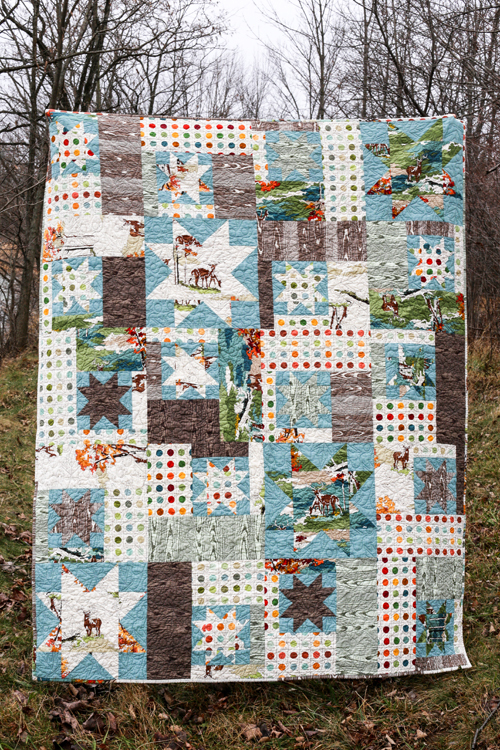 OK, Jeni, you are clearly the queen of makes for this quilt - 3, wow! And here I am just trying to make my first, after stashing away a full line of Mary Englebreit for this thing back in 2007. But here's the thing: I'm finding the pattern instructions fairly unclear and wonder if, after 3 makes, you have any sage advice. Like, is this a case of "don't overthink it"? Many thanks and Happy Thanksgiving to you and George! !